I didn’t want to post all these pictures right after the Nashville ones, but I think enough time has passed now. It’s hard to believe, actually, that it’s been 10 days since Andy and I took his brother to Chicago. It seems simultaneously like just yesterday, and forever ago. It’s not a trip to Chicago without a visit to the Lego store. 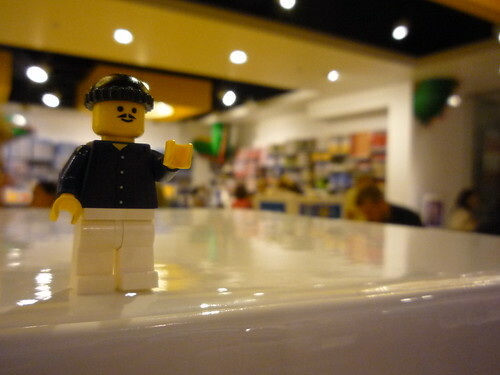 Andy and I tried to make a Lego version of his uncle Keith. 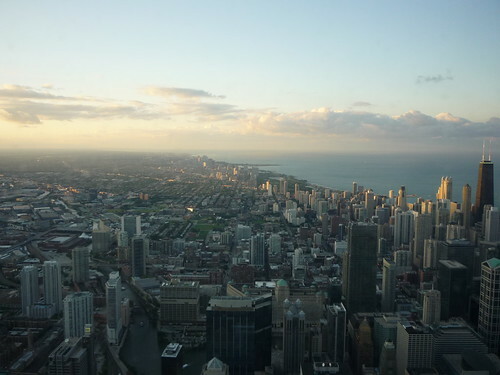 Tall Building #2 (Sears Tower) – The wait is ridiculous, but so is the view. 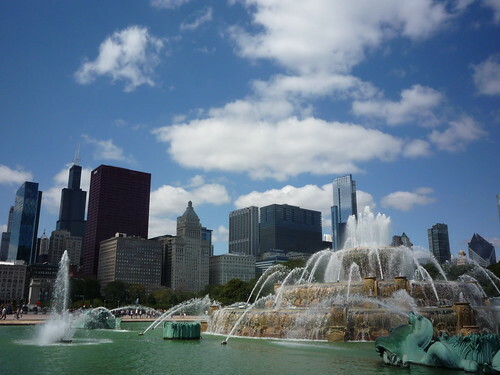 That fountain is positively beautiful. What a sight it must have been in person. 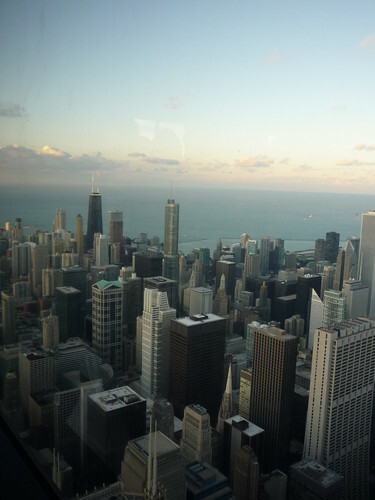 And the views from the Sears Tower! They are truly outstanding. Did you feel like you were on top of the world?! Great pictures although I have to tell you that last one makes me feel nauseous. I am afraid (perhaps terrified) of heights, and even seeing a picture of someone up high like that gives me the willies. You would never catch me in a photo like that. NEVER. 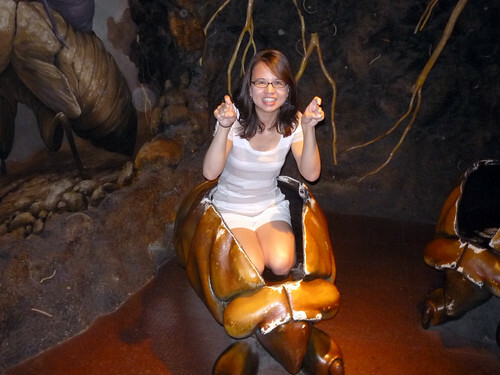 You are a brave woman to go out on that glass floor…yikes! Ooh, neat photos! You look so cute. :D I remember seeing the Blue Man Group when I was in Chicago years and years ago. Glad you had a great time! Looks like you had a lot of fun in Chicago. Nice pictures. So — which did you like better? 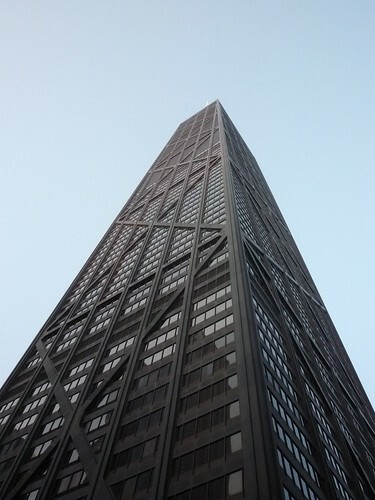 Sears Tower or Hancock Building? I liked Hancock. Honestly, guys? 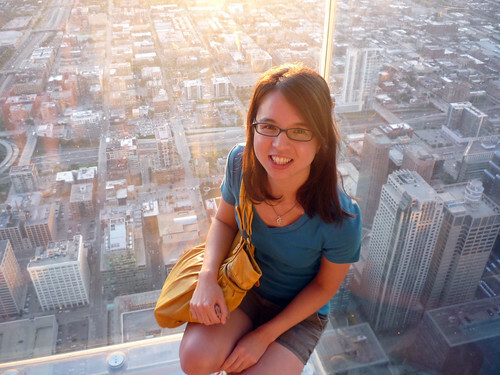 I’m not even afraid of heights, typically, and that glass box got my heart POUNDING. Hancock because there was no wait, lol. 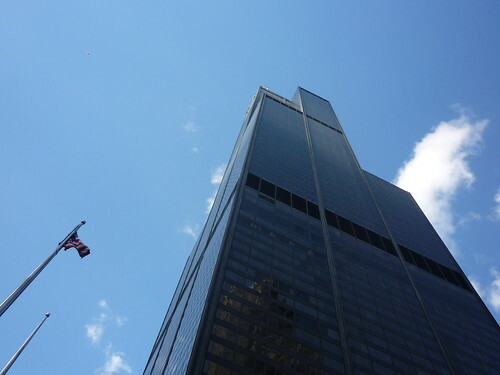 Last time I was in Chicago — not real recently — I also went to the top of the John Hancock building. And staring down at the sidewalks, I was struck by the fact that all the people below looked like ants. But it wasn’t because they were so small. It was because of the giant pieces of bread they were all carrying on their backs. Oh, wow. 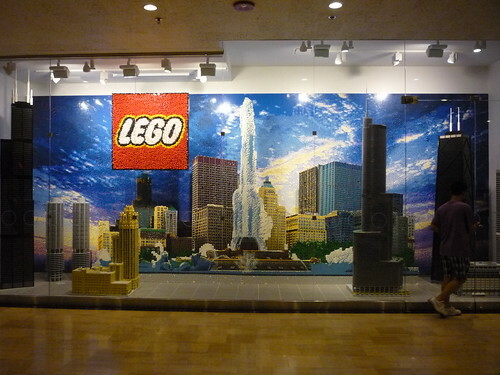 I want to go in the glass box with the skyline in the background. Bravo on the photos. Amazing.